Do you know a mother that has a sweet tooth? (I don't know many who don't!!) Then I have the perfect Mother's Day gift idea for them today - Cheryl's delicious cookie treats and gifts!!! Cheryl's offers a wide range of exclusively designed gifts and gift baskets, perfect for any occasion, including birthdays, anniversaries, Valentine's Day, Mother's Day, Father's Day, Christmas and Hanukkah; as well as any sentiment you wish to express — Thank You, Get Well, Best Wishes, and Thinking of You. They have an amazing list of different types of cookies, but here's a short list: assorted cookies; oatmeal raisin cookies, frosted hearts cookies, frosted mint chocolate cookies, frosted eggs cookies, macadamia white chip cookies, chocolate chocolate chip cookies, chocolate chip cookies, frosted lemon burst cookies, frosted chocolate caramel pecan cookies, frosted pumpkins cookies, and snickerdoodle cookies. Their cookies are baked fresh; they guarantee the quality, freshness, and presentation of their gifts. That is why I absolutely LOVED Cheryl's cookie gifts! I generously received the Spring Bloom Cookie Flower Pot to enjoy! 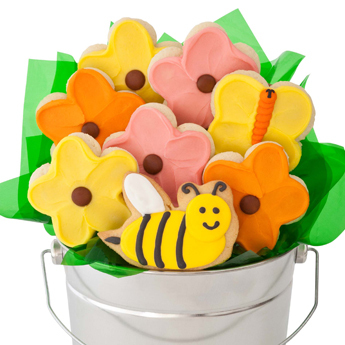 Celebrate the arrival of spring with the NEW cookie flower pot. Enjoy a tasty combination of buttercream frosted flower cut-out cookies and hand decorated crunchy shortbread cookies delivered in a shiny silver pail. It includes 8 cookie flowers. Not only was this cookie treat so cutely arranged and perfect to celebrate spring, but the cookies were absolutely delicious! The cookies were so soft and the buttercream so creamy too! They literally melted in my mouth the minute I took a bite! These cookies got me through the last weeks of my pregnancy and the first weeks of being a mother of two!! Whenever I needed a sweet treat, I loved to reach into my "flower pot" of cookies and unwrap a delicious cookie! If you know a mother who likes her sweets, definitely take the sweet treat route this year and order them a super cute cookie gift from Cheryl's! They are sure to love how cute they are and how deliciously soft the cookies are!! Buy It: You can purchase the Spring Bloom Cookie Flower Pot starting at $39.99 on Cheryl's website.